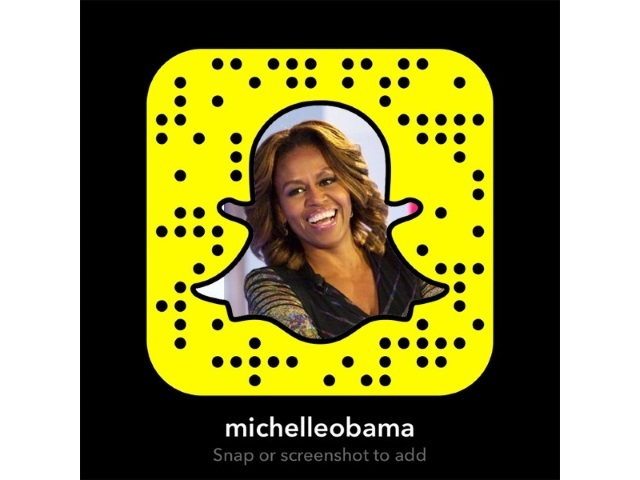 One of Snapchat’s newest users is none other than first lady Michelle Obama. Obama launched the MichelleObama Snapchat account in part to promote her Let Girls Learn trip to Liberia, Morocco and Spain and to share stories of the 62 million girls around the world who have no access to education. It’s no secret, young people today are avid Snapchatters—more than one-half of 13- to 34-year-old smartphone users are snapping their daily adventures. By following the first lady on Snapchat, you will see stories of the 62 million girls around the world who aren’t in school and find ways you can take action. You will learn more about ways to stay active and healthy—plus see the White House kitchen garden from planting to harvest. You will hear stories from members of our Joining Forces community. You will meet students who are beating the odds to Reach Higher to go to college. Plus, we promise many guest appearances from Bo and Sunny, too. Next week we are taking the First Lady’s followers abroad on the First Lady’s Let Girls Learn trip to Liberia, Morocco and Spain to visit young girls who are working hard to for their education. Stay tuned for behind-the-scenes snaps from her trip, including posts from actresses and advocates Meryl Streep and Freida Pinto. As part of Let Girls Learn, the First Lady–joined by Malia and Sasha Obama and Marian Robinson–will visit Margibi County, Liberia; Marrakech, Morocco; and Madrid from June 27 through July 1. The first lady and her family will return to Washington, D.C., July 1. In Liberia, the first lady will visit a Peace Corps training facility in Kakata, where she will meet with girls and young women participating in a GLOW (Girls Leading Our World) Camp. Her visit will highlight both the Peace Corps’ work to help girls in underserved communities build self-confidence, communication and other leadership skills and new programming from the U.S. Agency for International Development aimed at improving access to quality education and life skills for adolescent girls across Liberia. Also in Liberia, the first lady will visit a school in Unification Town for a discussion with adolescent girls who have faced serious obstacles in attaining an education. This discussion will be moderated by actress Freida Pinto, an advocate for girls’ education. The conversation will highlight both the educational barriers girls face as Liberia moves beyond the Ebola epidemic and the U.S. government’s efforts to continue to address those barriers and provide adolescent girls with equitable access to safe and quality education. President Ellen Johnson Sirleaf will join Obama during her visit. The first lady’s events in Liberia will take place June 27. In Morocco, the first lady—joined by Meryl Streep, also an advocate for girls’ education, and Freida Pinto—will participate in a conversation with adolescent girls moderated by CNN’s Isha Sesay. In the discussion, participants will discuss the challenges many girls in the region face in getting a quality education. The first lady’s visit will also highlight commitments made by the U.S. government through the Millennium Challenge Corp. and USAID in partnership with the Kingdom of Morocco to help adolescent girls in Morocco go to school and stay in school. The first lady will be in Morocco June 28 and 29. In Madrid, the first lady will deliver a speech on Let Girls Learn to girls and young women, sharing the stories of girls she has met in Liberia and Morocco–and her prior travels–and highlighting new commitments to support Let Girls Learn. Obama will encourage the audience to value their own educational opportunities, continue to strive for progress for girls and young women in their country and take action to help the more than 62 million girls around the world who are out of school. This event will take place June 30. While in Spain, the first lady will also meet with Her Majesty Queen Letizia. Snapchat users: Will you follow Michelle Obama?